A new Newzoo report suggests that gamers may be more receptive to brands on mobile than non-gamers. 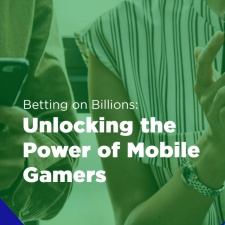 Created in collaboration with Activision Blizzard, the March 2019 Betting on Billions: Unlocking the Power of Mobile Gamers report sheds light on the demographics and trends of a global games market it believes is set to reach $148.1 billion this year. Over half of the gaming audience were said to trust advertising to keep them up to date on new products and services. 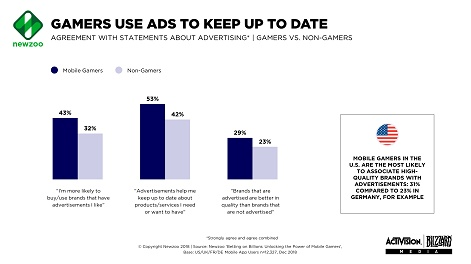 Across the board, gamers were found to be more accepting of brands and trust brands with marketing campaigns more than those without. The study also found that mobile games are the third-most popular type of media on the platform alongside music. It found 50 per cent of mobile users have launched a game app within the last seven days. Additionally, the overall gender split for mobile gamers is said to be a straight 50-50 split. Genre trends aren’t quite so even, with puzzle games more popular among older women and shooters a top pick for young men. In total, Newzoo claims more than 2.4 billion people will play mobile games this year. “This is a massive opportunity for many brands," said Newzoo director of marketing Emma McDonald. "The games market, with its innovative monetization strategies and highly engaged consumers, is seriously challenging the way traditional entertainment has worked for decades. The methodology for Newzoo's report consistent of 12,327 mobile app users across the US, UK, France and Germany ages between 18 and 65. Mobile gamers are classed as smartphone or tablet users who have opened or used a mobile gaming app in the past seven days, while non-gamers are classed as those who have not played on for seven days.